Crabbing Just Got Better with New Value Sets! Seafood lovers are in for a treat… The pioneer in bringing us seafood with Southern Creole flavours as well as some local flavours, Crab Factory’s concept of dining straight on the table with large seafood boils poured on the table is all about diners getting dirty deliciousness. With minimal utensils, it’s all about savoring glorious seafood with finger-licking yumminess. 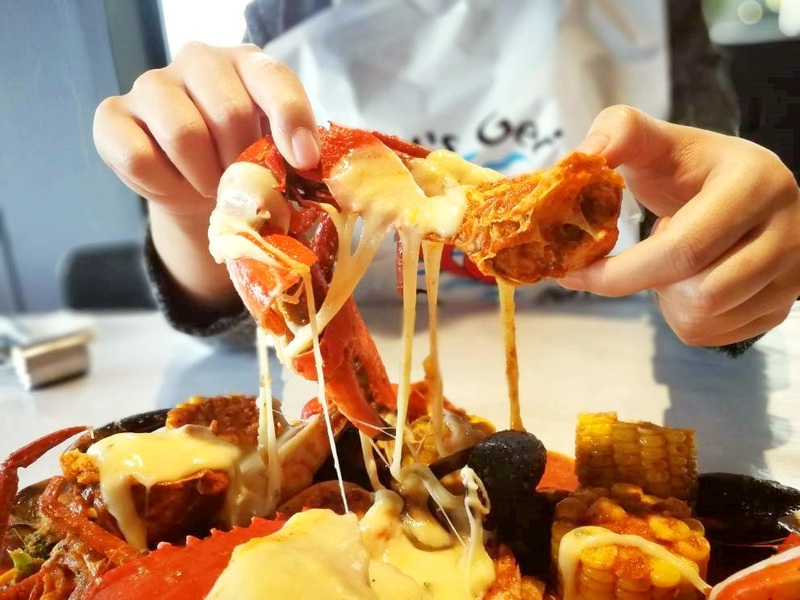 With a new menu on board, Crab Factory owner T.Y Ooi is not only making seafood affordable but introducing new lip-smacking Cheese and Salted Egg sauces, Crab Factory Value Meal sets and BBQ seafood as well as lunch specials. It’s all about the Cheese! Hot cheesy and creamy, it’s irresistibly yummy. Pour the Cheese Sauce over Crab Factory’s signature sauces and simply enjoy the creamy cheesy indulgence on your seafood for extra shioknness…. We all love our salted egg dishes but this one is extra special. 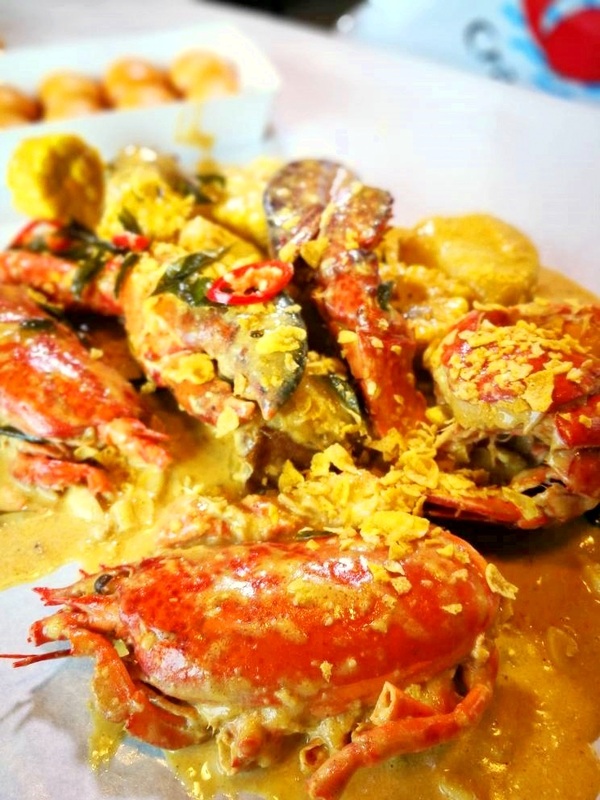 Crab Factory’s Salted Egg Sauce is more spiced up with a lusciousness of punchy flavours. The Salted Egg sauce goes really well with all seafood, elevating the sweetness with moreish spices. It is finished with aromatics and crunchy bits. Simply addictive, foodies are sure to be hook on sheer sublime flavours of this sauce! Making seafood affordable, Crab Factory has come up with new sets of seafood boils with its new sauces in tow. Crab Factory Value Meals offers 3 choices – Crab Lover Shiok, Crab Lover Party and Crab Lover Giler to cater to different groups of diner. These sets feed from 2 pax to 9 pax (est. RM49.90 to RM59.90 per pax) with upgrade options on various types of crabs. First up, we had the Crab Lover Party with Southern Bang Sauce (Medium Hot) with add-ons of 2 portion of cheese sauce. Getting down right dirty and delicious, this set has Meat Crab (2pcs XL), King White Prawns, Squid, Mini Lobsters, Hamaguri Clams Freshwater Prawns, Mussels, Corn and Potatoes. It also comes with 2 Fried Mantao and 4 Shallot Rice to go with all that yummy sauce. For those who never tried Crab Factory Creole sauce, this Southern Bang has a robust tangy kick of heat and moreish notes. We only opted for medium hot but hey, be my guest and ask for their hottest level if you are game for heat. The best part of this has yet to come. Now one can order a portion of oozing hot Cheese sauce, which we did, and add this on to the bag of Louisiana seafood boil. That Cheese sauce… it’s literally da bomb! Creamy and cheesy, the cheese sauce paired so well with the Southern Bang sauce. As we watch the cheese sauce being poured over the seafood, our mouths were literally salivated as the combination is utterly irresistible with the seafood and sauces. Succulent and sweet seafood, drenched in unbelievably creamy and spicy sauces, will make you want to keep eating. Mopping up all the saucy goodness with the Fried Mantou makes this even better. Just in case you need your rice, the Shallot Rice is also yummy on its own or with the sauces! If you’re dining in a big group of 7 to 9 pax, the Crab Lover Giler is the perfect Crab Factory Happy Meal featuring 2 bags of Louisiana boils of seafood in 2 sauces of your choice. We even upgraded one of the Louisiana boil bag with French Brown Crab (charges applies) instead of the Meat Crab. This Crab Lover Giler set is value-for-money as it also comes with 1 Fried Chicken Wings, 1 Fried Mantou, 1 Fried Squid Tentacles and 7 to 9 Shallot Rice. First Louisiana boil bag of Gang Giler #1 was upgraded with French Brown Crab in Garlic Butter Sauce. This one has Brown Crab, King White Prawns, Squid, Mussels, Hamaguri Clams, Corn and Broccoli. Garlic Butter has always been a crowd pleaser at Crab Factory. Diners can expect loads of buttery garlicky flavours in the lot of the seafood. It’s a sauce that pleases most palates as it enhances the sweetness of the seafood. Check out that rich roe in the Brown Crab! Our second Louisiana boil bag of Gang Giler #2 in Southern Bang Sauce (Medium Hot) also has lots of seafood such as Meat Crab (2 pcs XL), Mini Lobsters, Freshwater Prawns, Jumbo Sweet Prawns and Corn. This one is an explosion of firework flavours in the mouth and had us at Hello! Talk about a Malaysian classic, Crab Factory is introducing its own version of Salted Egg Sauce. We had the ala carte King Crab with Salted Egg Sauce. This order even comes with corn, potato and fried mantou. Crab Factory’s version of Salted Egg Sauce has more oomph of spices to deepen the salted egg note. Lusciously creamy and spicy, the salted egg sauce proved to be a matched for the sweet flesh of the King Crab as well as the other bag buddies. We also enjoyed mopping up this sauce with the mantou. Besides King Crab, there’s Red Lobster, Crab, French Brown Crab and all the other seafood that is available for ala carte order in your choice of sauce. Also new on the menu list, Crab Factory is introducing lunch specials of Noodles/Rice from SIXTH Bowl. Ordering is easy, pick a noodle, then select the toppings and the broth. There’s also rice bowls too. The Mix Balls (RM13.5) with Mi Xian in Superior Soup was tasty and it even comes with Char Kuey or Yu Tiao. There’s a generous mix of Fuzhou, Squid Ink & Fish Balls that is bouncy and delicious. The broth is full of umami notes and the added Char Kuey gave this noodle extra yum. We also tried the Freshwater Prawns (RM16.90 + 0.50 for spicy sauce) with Mi Lidi in Special Spicy Broth. It’s not overly spicy but rather enough heat to awaken your palate for more. This bowl is really decently priced for the 2 large Freshwater prawns that is sweet and full of luscious roe. Crab Factory is also giving back to the community with its Bowl-IT-Forward program. Diners get One Free Bouncy Balls Bowl for every 6 bowls purchased when dine-in at Crab Factory. Customer can either choose to enjoy the Free bowl or donate it to Charity. Crab Factory will visit selected children’s or old folks’ homes every 2 months to cook for them with your Free bowl. All the above are available at Crab Factory SS2 and Crab Factory Johor Bahru outlets. The next new menu of Bara BBQ is only available at Crab Factory Johor Bahru for now. Diners can enjoy a long list of BBQ seafood as well as other specials at the new JB outlet. There’s BBQ Crab (RM39 per crab) with choice of Cajun or Garlic. Charred to give the crab a smoky flavour with intensified sweetness of the crab, this one is excellent for those who enjoys the natural sweetness of the crustacean. Love oysters but prefer them lightly cooked? Feast your eyes on Crab Factory’s 12 BBQ Oysters (RM69) that comes with 12 different sauces. Best to enjoy them piping hot, we are reminded again how creative Crab Factory gets with all its different sauces. Hard to choose a favorite since these aphrodisiacs have different flavours that goes well with the briny plump oysters. Another dish worth sharing is the Best of Both Worlds (RM56.80) platter. Featuring Crab Factory’s Signature Coke BBQ Lamb Chop, Fried Freshwater Prawns and BBQ King White Prawns with sautéed vegetable and French fries, this one is unusual twist to the all-time-favorite surf & turf. The lamb chops were tender, juicy and moreish with a light tinge of sweetness and smoky aroma. An unusual addition on the menu is the Sotong Sumbat Coconut (RM33). A dish with a local flavour, the squid is generously stuffed with a lovely coconut filling, chargrilled till tender and served with a sweet and spicy sauce on the side. The Fried Quails (RM22.80) warrants a reorder in my books. Well-marinated and fried till nicely lacquered, it comes on a bed of crispy rice noodles, topped with sautéed aromatics and a tangy chili sauce. This one makes a nice addition to the plethora of seafood. Corn Croquette (RM11.80) may not be spectacular but it’s decent and great for corn lovers. The kiddies are bound to enjoy this crispy and creamy croquette well-studded with sweet corn kernels. Last but not least, Crab Factory JB also has some lunch specials. We tried their version of Hainanese Fried Chicken Chop (RM15.50). Crispy fried chicken thigh drenched in brown sauce and served with crispy potato wedges and sautéed vegetable makes a decent meal. This lunch special (up to 3pm) also comes with Ice Lemon Tea & a scoop of Ice Cream. Crab Factory has just open its sister outlet in Little Paris at Mount Austin Johor Bahru in August. About time too since foodies down South can now savor seafood Crab Factory style! We spent a short weekend getaway recently for some food hunting in the South and paid a visit to Crab Factory JB. It is quite easy to located Crab Factory JB since it’s facing the main road in that area. There’s plenty of parking too. The new outlet echoes its original outlet, industrial theme with bright shades of orange enriching the whole ambiance. Diners are also asked to express their creativeness on the wall with markers provided. With two new fabulous sauces in tow and new menu on board, it looks like Crab Factory is gearing up for some serious seafood bingeing for foodies. With new affordable Value Meal sets as well as lunch specials and let’s not forget a new sister outlet in JB, Crab Factory is taking seafood to new heights!